When it comes to R&B princess Ciara, we all know she is sweet as pie and drop dead gorgeous, but one thing she fails to do is blow us out the water with her voice. 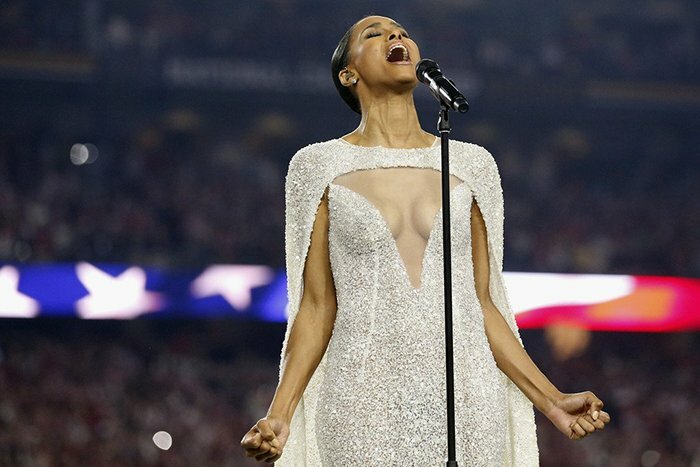 From flat notes to unsuccessful high notes Ciara has disappointed again. Not everyone can sing the national anthem, but this is exactly what CiCi tried to do. You can be the judge and watch the clip below and tell us what you really think of Ciara’s performance. On a positive note Ciara brought her A-game to the NCAA championship with what she was wearing; a gorgeous sparkling gown with a cape. At least her boyfriend, Russel Wilson enjoyed her performance. “I see you baby!! Sounded amazing & looked flawless in every way! @Ciara,” he tweeted.